I wrote half of this book in January 2011, then stopped to publish and promote my first series, then came back and wrote the other half in June, 2011. I knew before I even introduced Emma in Sudden that she and Marcus would end up together. I didn’t know until Marcus told Emma exactly what happened to Olivia. I knew after what she did to Caroline’s wedding dress that she needed to vanish, but I didn’t realize she’d gotten herself knocked up until Marcus informed Emma of her fate. I’m TERRIBLE at music, so writing the music lessons and the impromptu musicale was a lot of fun for me. All I had to do was recollect my own musical abilities and I had the sounds crisp and clear in my mind. I’ve been asked to write a story about Louise, but frankly, I think she deserves to be miserably married to the womanizer she married. I completely made up Lady Bird’s Ladybird Memoir. That said, I get Google searches or emails inquiring about the book and where they can find a copy. I did NOT plan for he initial E.S. to be Emma Sinclair (the name attached to the articles that Alex loved so much from his popular science circular–this first appeared in my first book and just continued). It was just purely by coincidence that those initials lined up with the love of Marcus’ life and when I was writing the epilogue for Reluctant, it occurred to me that they lined up and I decided to capitalize on it as if I’d known it all along. This is the only book (so far) that I has led to me receiving hate mail. I have received a few emails since publication where the author of the email was furious that I didn’t give Marcus and Emma a miracle baby. The reason I didn’t was because, to be frank, life isn’t fair. There are couples who aren’t able to have children, no matter how much they want them or what they try. I wrote this book for those ladies. I hate reading books where the hero (or heroine) has had some sort of accident or condition that makes them sterile then they have a miracle baby in the epilogue. This book has inspired some of my most emotional (in a good way) emails. For every email I get where people are unhappy that there wasn’t a miracle baby, I’ve received double that number from women who were unable to have children who were so glad that I didn’t give them a miracle baby because it made it more real and easy to relate. This was my biggest jump in an epilogue. Most were the next day or a few months later. This one jumps 50 years just to prove that the two of them could be satisfied together as a family. This series was only supposed to have three books, but as soon as I wrote Wallace on the page, I was in love. I really wanted him to get a happily-ever-after, BUT I didn’t think the world would respond the same way. So when a few beta readers asked what his story was, I got the idea and that very night, I paced the floor until 3am divining his story. The original cover for this book was actually the one that ended up on Secondhand. The cover artist asked for some basic information about the ladies in the series. I mentioned that Emma had green eyes and I think she gave her the green dress to match the green eyes. I, however, knew instantly that wasn’t how it was meant to be and had her switch them. Previous postWhat do you expect at the end of a book? I confess. I googled Lady Bird’s book. I could so see that! 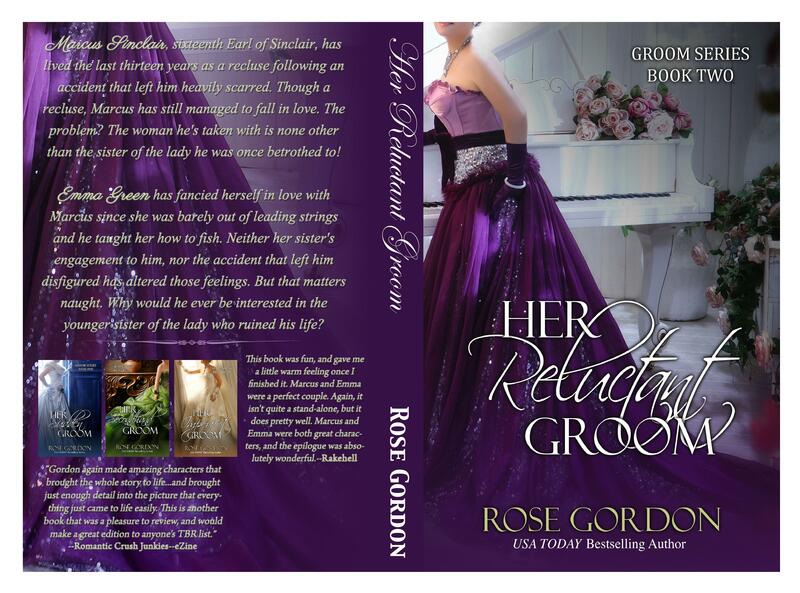 I just love the colors on the covers of your groom series books! I love them, too. So dark, yet so vibrant. I laughed out loud when you admitted that you get emails inquiring about Lady Bird’s Ladybird Memoir, to funny! I have to admit I was upset that you didn’t write Marcus and Emma to have a baby of their own. I love complete happily ever afters, but I can accept it the way you wrote it because I myself cannot have children. I didn’t have an accident or anything of the such, I was just born with my problem and nothing can be done to correct it either. I completely understands what Marcus feels, I know I was devastated when I was told that I couldn’t have children and if by some miracle I did get pregnant I wouldn’t carry to term due to my condition. Also I am happy you gave Wallace his own book. He is my favorite, everything about him I absolutely love! He is so perfectly flawed! I know it’s fiction, and happy endings happen all the time, but sometimes they just don’t. I’m glad you can accept it! Oh, and Wallace IS so perfectly flawed, isn’t he?